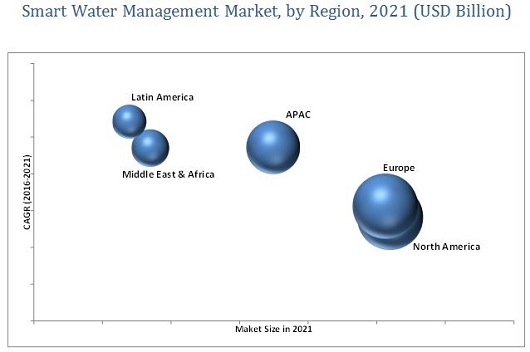 [139 Pages Report] The Smart Water Management market is estimated to grow from USD 8.46 Billion in 2016 to USD 20.10 Billion by 2021, at a Compound Annual Growth Rate (CAGR) of 18.9% during the forecast period. The base year considered for the study is 2014 and the forecast period is from 2016 to 2021. Cloud-based services, advanced analytics, and IoT technology are some of the disruptive technologies likely to impact the future of the market. The integration of Smart Water Management helps enterprises’ systems monitor, analyze, and control & manage water network related data from smart water meters. The solutions like Advance Metering Infrastructure (AMI), Supervisory Control and Data Acquisition (SCADA) and Meter Data Management (MDM) already have high global acceptance in the utility industry; however, new and emerging solutions such as network monitoring and smart irrigation are expected to witness high growth rate in the future. The Smart Water Management market is expected to grow at a high rate during the forecast period. North America is expected to hold the largest market share of the market, followed by Europe as both the regions will show high adoption rate of Smart Water Management systems. This report aims to estimate the market size and future growth potential of the market across different segments such as advanced water meters, solutions, services, and regions. The report also focuses on information regarding the key factors (drivers, restraints, opportunities, and challenges) influencing market growth. Additionally, the opportunities in Smart Water Management market are providing strategic profiles of the key players to the stakeholders present in the market, thereby allowing the stakeholders to comprehensively analyze the core competencies, and to draw the competitive landscape of the market. The market ecosystem comprises Smart Water Management product providers such as ABB Group (Switzerland), General Electric (U.S.), Itron (U.S.), among others; solution providers such as IBM Corporation (U.S.) and Schneider Electric (France), among others; and service providers such as ABB Group (Switzerland), General Electric (U.S.), Itron (U.S.) and Schneider Electric (France), among others that maintain and update the entire software system and sell them to end users to cater to their unique business requirements. MarketsandMarkets forecasts the Smart Water Management market size to grow from USD 8.46 Billion in 2016 to USD 20.10 Billion by 2021, at a Compound Annual Growth Rate (CAGR) of 18.9%. Aging infrastructure and restricting non-revenue water losses are some of the key factors driving the market. Other driving forces include the growing need for operational efficiency and cost savings. The Smart Water Management market is broadly classified into advanced water meters, solutions, services, and regions. The solutions segment is further divided into Enterprise Asset Management (EAM), SCADA Systems, and Meter Data Management (MDM) for water and wastewater utilities, network monitoring, advanced pressure management, advanced analytics, residential water efficiency, and smart irrigation management systems. The services segment as compared to the solution segment is expected to grow at the higher CAGR during the forecast period. The services in the market are aimed at enabling smart and coordinated decision making processes and mitigating the risks and vulnerabilities of the market using efficient tools and techniques. The smart irrigation management systems solution is expected to grow at the highest CAGR during the forecast period as it helps in reducing more than 50% of portable water used for residential and commercial landscape irrigation. The growing population and depleting reserves of freshwater are some of the factors which accelerate the growth rate of smart irrigation management systems. The Smart Water Management market is segmented across five regions, namely, North America, Asia-Pacific (APAC), Europe, Middle East and Africa (MEA), and Latin America, wherein detailed analysis is provided. North America is projected to dominate the market with the largest market share during the forecast period owing to technological advancements and early adoption of Smart Water Management software and services in the region. The market in Latin America is expected to grow at the highest CAGR between 2016 and 2021. Most of the southwest areas in this region face water scarcity, and the adoption of smart water technology solutions is expected to enhance water conservation. Smart water metering systems are being adopted by water utilities in Brazil and New Mexico areas. The adoption of Smart Water Management solution and services is growing at a high pace in the developing regions, such as Latin America and MEA. However, inadequate financial incentives prevent several utilities and government in these regions from adopting Smart Water Management software and services. Moreover, the lack of awareness and rapidly changing technology act as major restraining factors for the growth of the Smart Water Management market. On a strategic front, many companies are utilizing different growth strategies, such as mergers & acquisitions, partnerships & collaborations, and product developments to increase their share in the Smart Water Management market. For instance, in January 2016, Honeywell, a U.S. multinational company, acquired Elster Group from Melrose industries, a London-based industrial investor, for 45 billion. On the partnership front, in March 2016, GE collaborated with American Water, the largest water trading waste water utility company in the U.S. Together both companies launched a digital initiative which aimed at solving water industries’ challenges and help the country become smart in its water utility for the future. Some of the major technology vendors include ABB Group, IBM Corporation, Schneider Electric, General Electric Company, Itron, and Siemens.